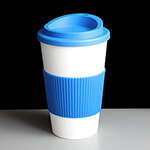 Reusable travel mugs are ideal for delis and coffee outlets who have a regular clientel who wish to clean their own take away coffee mugs and bring back for refills on a regular basis. 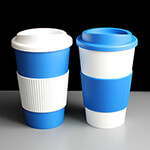 These are perfect for customers who are conscious of the disposable coffee cups landfill and waste issues surrounding the industry and are able to supply a re-fill service. 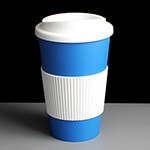 The travel mugs below can be branded on the comfort sleeves, are comfortable to hold and fit in coffee holders.